H Wilson's FP2500 flat panel stand with an accessory shelf is designed for 32" - 60" flat panel televisions. It has a weight capacity of 100 lbs. This stand's height is adjustable in 2" increments. It also features cable management through the main column and has casters with locking brakes. The FP2500 is constructed with seamless pipes and is finished with a powder coat. Part Number FP2500. Very durable solid construction and the casters are an extra benefit. The shelf is adjustable also sturdy and wide and could easily hold whatever components you add. The construction was easy enough using the pictured guides took me less than an hour with simple tools i.e. Phillips screwdriver 34 wrench. This thing will never breakdown! Great value Review by Beth C.
This is an excellent price for this. I have purchased these at work before from AV suppliers and paid several times as much for the same brand. Materials included with the FP2500 TV Stand. Tools needed for assembly. Step 1a: Remove pre-attached mounting plate from metal rod. Step 1b: Remove screws from metal rod and slide rod off of adjustable poles. Step 1c: Push in spring plungers to offset them from holes. Step 1d: Hold poles (B2). Keep a foot down on (B1) for stability. Pull poles (B2) upward until you reach desired height and twist to lock plungers in place. Step 2a: Flip base (A1) over so caster holes face upward. Step 2b: Thread casters (A2) and washer (A3) into base. Tighten fully with a wrench. Step 2c: Flip base (A1) over and lock all four casters (A2) to prevent movement. Step 2d: Attach poles (B1) to base (A1) so that grommet holes are toward the back, using screw (K) with allen wrench (M). Step 2e: Flip unit on its side and attach screw (K) to base (A1) with allen wrench (M). Step 2f: Flip the unit back up and attach screw cover A4 so it locks in place. Step 3a: Remove remaining pre-installed screws from metal rod (B5). Step 3b: Insert metal rods (B5) into back openings on the poles (B2) making sure screw holes face wire management holes. Step 3c: Refasten metal rods (B5) with screws. 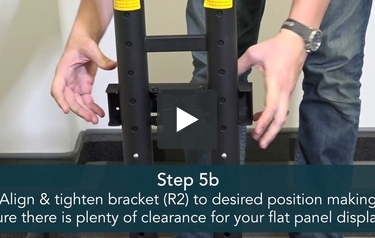 Step 4: With assistance push both spring plungers in and pull up to desired height (keep fingers clear during any height adjustment to avoid injury). Step 5a: Remove pre-installed screws from bracket (R2) & (R3). Step 5b: Align & tighten bracket (R2) to desired position making sure there is plenty of clearance for your flat panel display. Step 5c: Hook the shelf support (R3) onto the bracket (R2) and fasten the screws with a screwdriver. Step 5d: Attach the shelf guard to Shelf (R1). Step 5e: Position the shelf (R1) and fasten with screws and allen wrench (L). Step 6a: With assistance, lay your flat panel display on a soft surface. Depending on your TV model you may need to use different combinations of plastic spacers and different screw sizes (G, H or J)—making sure not to over thread into your tv screw hole. Step 6b: Lay vertical mounting bars (C2) flat on tv again making sure to use proper width and length screw for your specific TV. Step 6b: Line up the next vertical mounting bar (C2) so that it matches the position of the previous bar. Step 6c: Line up long horizontal bar (C3) so long oval holes are closer to bottom of tv and resting flush on threaded screw holes of both left and right vertical brackets (C2). Step 6c: Using the smaller screws (T) mount to the threaded insert. Step 6c: Make sure the next horizontal bar is in the same positioning as the first and line up to the upper threaded screw inserts. Step 6d: With screw (T) attach the large mounting plate (C1) making sure the arrow is pointing towards the top of your TV. Step 7a: Lift up the lock hooks on the mounting plate prior to attaching TV to the unit. Step 7b: With assistance attach the hooks on the mounting plate (C1) onto the metal bars (B5). Step 8: Attach the wire management holes onto the unit. Step 8: Insert cables and cords like so. Congratulations! Assembly Complete.